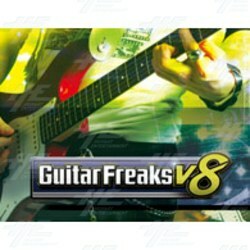 GuitarFreaks V8 is the 20th version in the long running music video game series from Konami. Includes new music from Konami as well as new licensed tracks. This version supports e-AMUSEMENT PASS where available. With the use of the e-amusement pass, when players play they can earn and accumulate "GDP". Once enough points have been collected, players are able to play a hidden song. With the e-amusement pass players can also save their data, including detailed information about song results and percentage complete.